Great alternative to Pizza. This is a kids approved version of our flat breads, for a more sophisticated palate you can add Kalamata olives, Feta Cheese, Aurugula pesto and Artichokes. Separate dough in 12 portions and dust your table with flour. Roll each dough to a 1/8 thickness. 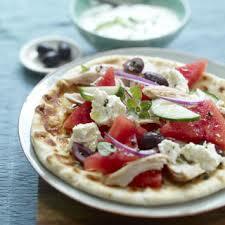 With a pizza cutter, cut each flatbread dough to the same size, about 4 inches in diameter. You can use a ring mold to guide you. Have all your vegetables and cheese ready. In a warm skillet, toast your flat bread. Do the first side and after flipping to the other side add the cheese, spinach, cucumber and tomatoes. Cook for 1 to 2 minutes. Make sure it doesn’t burn.